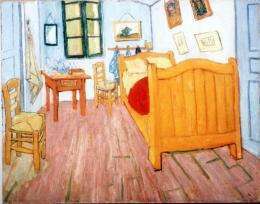 Vincent Van Gogh's "The Bedroom", painted in October 1888. A new blog will allow art lovers to follow the restoration, step by step, of Dutch post impressionist painter Vincent van Gogh's famous "The Bedroom", the Van Gogh Museum said Thursday. A new blog will allow art lovers to follow the restoration, step by step, of Dutch post impressionist painter Vincent van Gogh's famous "The Bedroom", the Van Gogh Museum said Thursday. "It is the first time we have rendered each step of a restoration accessible to the public in this way," the museum's director Axel Ruger said in a statement. The blog, www.vangoghmuseum.com/bedroomsecrets , will have weekly updates of the restoration work with pictures and video, the museum said. Van Gogh painted the canvas in Arles, France, where he lived in 1888 and 1889 in the well-known "Yellow House" which he shared for a while with fellow painter Paul Gauguin. The painting was damaged during the artist's lifetime due to damp conditions in his studio, said the museum. "To stop the paint flaking off, Van Gogh pasted newspapers over the canvas and wanted to have his brother Theo reline the work with an additional canvas to reinforce it." The painting was extensively restored in 1930. "The current treatment plan will ensure the painting is preserved as well as possible for future generations." Has the mystery of the Portrait of Maud Abrantes been solved? Probing Question: Are artists born or taught?